The webOS 1.2 update brought many much-appreciated new features, updated old features and software bug fixes. Of course, there are also a few issues to deal with (especially when it comes to Exchange), but overall most users are enjoying the update. This release addresses several security issues with Palm webOS software. We would like to thank Townsend Ladd Harris for his help in identifying some of the issues addressed in this release. Townsend Ladd Harris runs this computer security blog and has reported several security issues with the WebOS in previous versions. What he found in 1.1 was pretty serious. The security issue in question concerned the email application and malicious code in emails. 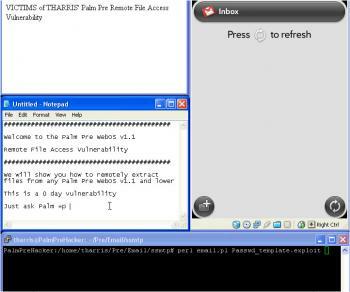 Essentially an email with malicious code could provide remote access files on the WebOS device. Harris has even gone so far as to demonstrate the process in this flash video, showing how potentially devastating this malicious code could be; all your emails and contacts snatched simply by opening a malicious email. In other words - thank heavens for webOS 1.2. If you're holding off on updating (or have downgraded back to 1.1 because of Exchange compatibility), we're thinking it's safer to get your Pre up to date.